For a deeply intensive cream that works to eliminate spots which have become embedded in your skin, Shiseido Intensive AntiSpot Serum (30ml) is ideal. It contains the unique D-N-A Spot Target formula, capable of breaking down unwanted areas of pigmentation and removing them from your complexion. 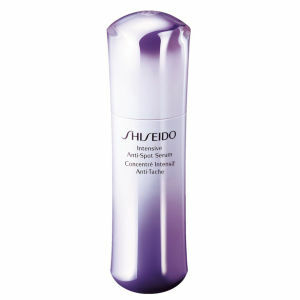 Shiseido Intensive AntiSpot Serum is a specialist product that reflects the company's 100 year history in the treatment of pigmented skin. It is safe for use on all skin types, has an anti-aging effect and delivers a radiant finish. To use, simply apply to the affected area, morning or night as part of your normal skin care routine.